This is the last of the More Power Tapes releases that were sent to me and I saved the best for last. I've reviewed prior albums from Space Wolves on this website and if you've read those, you probably already know that I really dig these guys. Their fifth album V is no exception. I really wish someone was putting these Space Wolves records out on vinyl. I'd certainly buy a copy. Heck, put them out on CD and I'd pick one up. 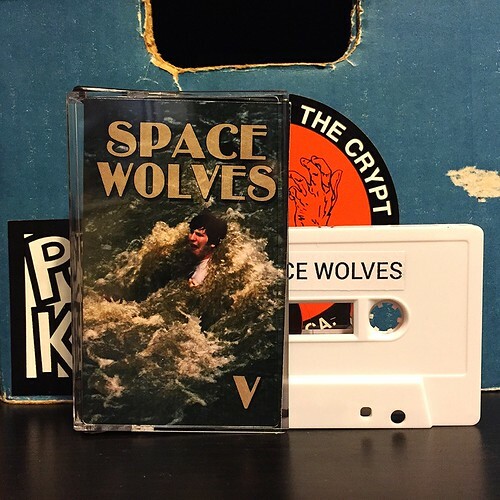 Sadly all five Space Wolves records are confined to cassette tape hell, but that shouldn't dissuade you from giving these guys a shot. Jangly, treble heavy guitar can be one of my favorite sounds in the world. It can be used in so many ways from the power pop of folks like Gentleman Jesse to the slower groove of a band like Silver Scooter. Space Wolves actually sit very nicely in the middle of those two bands, calling on each side of the spectrum throughout this record. You've got some uptempo fast and catchy burners and then there are a fewer that slow things down and take a more melodic approach. The band is equally successful at both. I only have two negatives on this album. One isn't even really a negative as I think this tape is a little too short and I wish there was more to listen to. So that's more me being selfish than the band doing anything wrong. The other one is more of just a pet peeve of mine as there are quite a few songs that end with the song fading out. I couldn't tell you why that bugs me, but it's just one of those things that I don't like. Still, these criticisms are very minor and I really dig this as a whole. Keep it up guys.